NEW YORK -- On a freezing day this past winter, a small group of protesters gathered outside police headquarters in downtown Manhattan. They were barely noticed by the throngs of reporters who streamed through the doors of 1 Police Plaza to watch a celebrated cop be sworn in for his second turn at the helm of America's largest police force. Calling themselves "New Yorkers Against Bratton," the protesters warned that the new chief, William J. Bratton, wouldn't mend the New York City Police Department's troubled relationship with people of color. Some had lost family members to police violence, and they had not forgotten who led the force when cops gunned down 13-year-old Nicholas Heyward Jr. in a housing project in 1994, when they strangled 29-year-old Anthony Baez in a scuffle after a football hit a police car the same year, when they filled Anthony Rosario and his cousin with bullets as -- according to one investigation -- the two men lay facedown on the floor of a Bronx apartment in 1995. Outside City Hall on Monday, the protesters were back. This time, reporters surrounded them. "What Commissioner Bratton has shown is that he's unable to control his own police officers, and he has never done anything to address the systemic brutality that keeps happening for low-income, predominantly people of color in New York City," Josmar Trujillo told the crowd. "Another black man is dead at the hands of the NYPD." 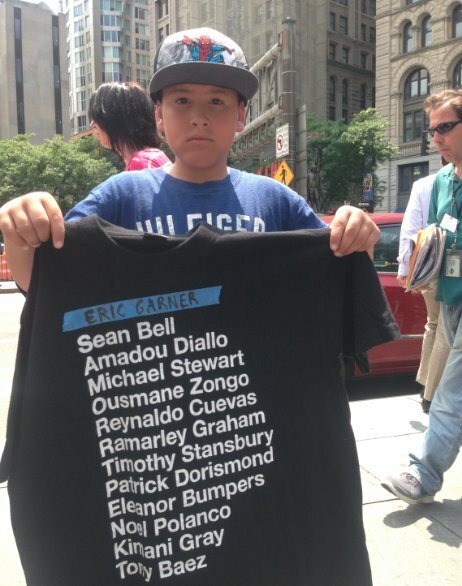 A young protester outside New York City Hall on July 21, 2014, holds a T-shirt naming people killed by the NYPD over the years. The man in question, 43-year-old Eric Garner, died on Friday after an NYPD officer in Staten Island grabbed him in an illegal chokehold. Garner did not have a weapon and had not committed a violent crime. According to Commissioner Bratton himself, what Garner did wrong was sell untaxed individual cigarettes, or "loosies." The Police Department didn't respond to questions from The Huffington Post on Monday afternoon. But at a press conference on Friday, Bratton said that the sale of untaxed cigarettes constitutes "a seemingly minor quality-of-life offense, if you will." That "seemingly" is a loaded word. Bratton built his career on the theory that what may at first appear to be mere petty offenses, like graffiti and small-time pot dealing, are in fact the seeds of deeper troubles, like the widespread violence that plagued the city before his first stint as commissioner from 1994 to 1996. Now, as he again faces anger over the conduct of the officers under him, the validity of this idea is being called into question. In the first six months of Bratton's second stint as commissioner, he has aggressively gone after low-level offenders, such as panhandlers and subway performers. Earlier this month, a viral video showed cops arresting a black man for sleeping in an empty subway car. "For what!? For what!?" the man yells at the beginning of the video, which has since been taken down. "'Cause I'm sleeping?" Last week, moments before he died, Garner expressed a similar sense of bewilderment. "Every time you see me, you want to mess with me!" he shouted. "I'm tired of it!" The campaign Communities United for Police Reform called Garner's death "yet another example of unnecessary police encounters resulting from broken windows-style policing that targets New Yorkers of color -- in this case escalating with fatal consequences." Bratton offered a general explanation of his hard-nosed approach back in April, when asked by reporters why he had ordered his officers to crack down on people dancing in the trains. "Those activities just create a sense of fear or that we're not paying attention to disorder," he said. "We are paying a lot of attention to disorder." Disorder has preoccupied Bratton from the beginning. Long before he was arresting subway dancers, he seized upon an influential article about the hidden dangers of "broken windows." "Consider a building with a few broken windows," wrote social scientists James Q. Wilson and George L. Kelling in The Atlantic Monthly in 1982. "If the windows are not repaired, the tendency is for vandals to break a few more windows. Eventually, they may even break into the building." Bratton hailed Kelling as an "intellectual mentor" and invoked his "broken windows theory" as a justification for getting tough on turnstile hoppers and dime-bag peddlers back in the '90s. The city's arrest rate soared under Bratton's watch, and reports of serious crimes plummeted. Supporters praised him for his "zero-tolerance" approach; Kelling compared him to Plato. Police departments from Philadelphia to Seattle adopted his methods. But as New York's arrest rate climbed, so did the charges of police misconduct, especially in heavily black and Latino areas. According to police statistics cited in a 1996 report by Amnesty International, 31 civilians were shot dead by cops in Bratton's first year as commissioner, compared with 23 the year before; the number of civilians who died in police custody similarly rose from 15 to 23. Nearly all the victims were black or Latino. According to Alex Vitale, a sociology professor at Brooklyn College, it was all for naught. "No one has produced a real academic study showing how enforcement of low-level crimes has resulted in a drop in major crime," he told HuffPost at the City Hall rally Monday. Instead, Vitale characterized the drastic drop in New York's crime rate over the last 20 or so years as part of a "national and international phenomenon" that can't really be explained. "Everyone thinks, 'Oh, in New York we solved the crime problem with this aggressive policing,' but that does not explain why there was a similar plummeting of crime in Montreal, San Diego, Chicago," Vitale said, pointing to cities where the strategy wasn't used. When Mayor Bill de Blasio took over the city some seven months ago, many hoped that press conferences about New Yorkers' deaths at the hands of police would largely be a thing of the past. De Blasio had surged ahead of his election rivals while promising to stop the abuses of "stop and frisk" -- a key weapon in the broken-windows arsenal. Bratton, often credited as an architect of stop-and-frisk, has suggested that the department wielded the tactic recklessly under Ray Kelly, the police chief who most recently preceded him. At Bratton's swearing-in ceremony on that frigid day back in January, he professed a commitment to getting "every member" of the NYPD to treat all New Yorkers with respect, "regardless of their background, their class, their race." "Why is it," he asked that day, "that so many in this city do not feel good about this department that has done so much to make them safe? What is it about our activities that have made so many alienated?" Nicholas Heyward was among the protesters standing outside in January. The police had shot and killed his 13-year-old son 20 years ago. The boy had been playing with a toy gun in his Brooklyn apartment building. "We've been opposed to Bratton from the very beginning, because of his practices and his policies," said the father on Monday. "And to bring him back, what made people believe that things were going to be different?"